As business blossomed, the California citrus packer began experiencing bottlenecks in its packing operations. A sophisticated automated palletizing system cleared the jam. Situated in the heart of Central California's orange- and lemon-growing region, Bee Sweet Citrus specializes in packing and shipping California citrus, supplying customers around the world with oranges, lemons, grapefruit, mandarins, and the like. Since its founding in 1987, the business has blossomed from a startup operation that handled 10,000 cartons a year to one that now handles 10 million. But the story hasn't been all sweetness and light. In 2016, for example, it became clear that things were starting to sour at the company's 400,000-square-foot facility in Fowler, Calif., which provides cold storage, packing, and distribution services for customers like grocery stores and big-box retailers. To be specific, the company was encountering bottlenecks at the ends of its packing lines—bottlenecks that were putting the squeeze on its operations. 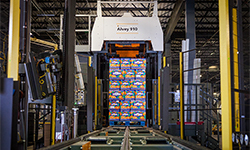 This Alvey 910 series high-speed in-line palletizing system is one of two that Bee Sweet uses to handle its varied product offerings. At the time, cases of citrus were being palletized by hand after they were packed. That required a lot of heavy lifting on the part of workers—the facility handles some 50,000 cases daily during peak seasons, with each case weighing around 40 pounds. It wasn't unusual for work to fall behind in the manual palletizing area, creating slowdowns further upstream or even bringing activity to a halt. The pressure to perform under these conditions took a toll on morale. "We had a lot of turnover before as a result of the pace of our stacking, and it was a lot of lifting for our people," says Thomas Marderosian, industrial technology manager at Bee Sweet Citrus. To solve the problem, Bee Sweet began looking into options for automated palletizing. But it knew from the start that finding the right solution wouldn't be easy. Because of its diverse product offering, the company needed a system that could handle more than just the most common sized cartons and packaging. Instead, it needed a system with the flexibility to handle a wide variety of citrus products, carton sizes, and stacking arrangements—and do it all quickly and efficiently. Although it required a lengthy search, the company eventually found exactly what it was seeking. 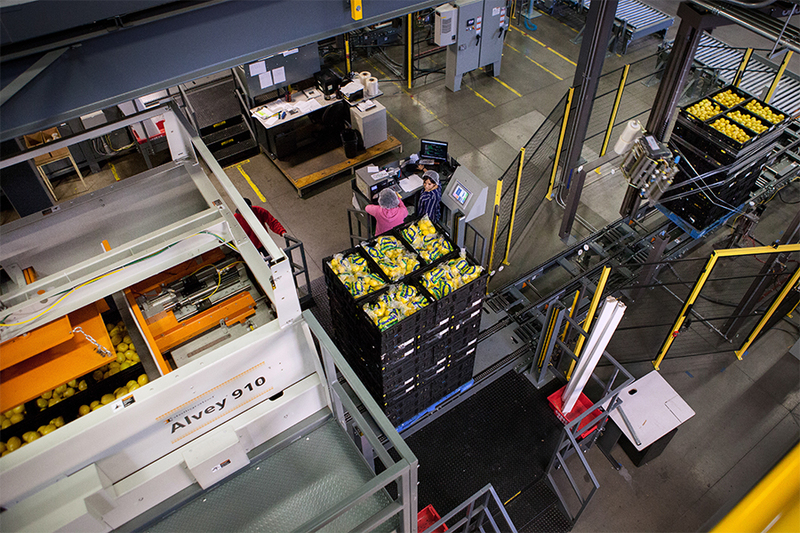 After a competitive bid process, it chose a solution from Honeywell Intelligrated that consists of two Alvey 910 series high-speed in-line palletizing systems, an accumulation area, and automated stretch wrappers supplied by Orion. Processing at Bee Sweet Citrus starts with local growers delivering fruit to the Fowler facility, which processes about 3,500 bin loads of oranges, lemons, mandarins, grapefruit, and other citrus each day. Each bin measures 48 by 48 by 28 inches and weighs about 900 pounds. Upon arrival, much of the fruit goes directly into temporary storage, where the citrus spends time "de-greening." When the fruit has ripened, the bins are taken to processing. Here, they are gently emptied onto lines for washing and initial sorting by size and grade—a process carried out using both automated equipment and visual inspection. During peak seasons, the facility is capable of processing 14 different varieties of fruit at the same time. After the initial sorting, the fruit is further sorted according to industry standards pertaining to fruit size, shape, and sweetness. Higher-graded fruits then move on to a packing area, while lower-graded and blemished fruits are sent to other facilities that produce juice. Damaged fruit is sent to companies that make animal feed. Once they arrive in packing, the higher-grade fruits are placed into cartons, bins, or bags. Some varieties are packed using automated equipment, while others are packed manually, depending on type and customer preference. Once the packing is completed, three conveyor lines move the products to an adjacent building for palletizing. 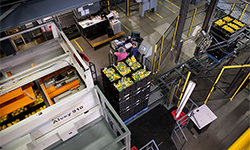 The palletizing building contains two complete automated palletizing systems that work independently of each other—one equipped with three delivery magazines and the other with two. The palletizers are designed for optimal flexibility and can handle 95 percent of the varieties of citrus processed by Bee Sweet. They can also accommodate six different packaging types, including industry-standard 40-pound cartons, open-top nested trays, telescopic cases, reusable plastic containers, and euro cartons, as well as a variety of pallet sizes. On top of that, the system can handle 29 different stacking patterns to accommodate variations in case size and pallet footprint. In addition to the two automated palletizers, the building also houses a manual palletizing operation. Currently, about 80 percent of total volume is palletized by the automated equipment, with manual handling reserved for items like odd-shaped boxes or partial pallet loads. Cases bound for the automated palletizing area pass through scan tunnels before being sorted and sent to one of the palletizers. Cases bound for the automated palletizing area enter the 31,140-square-foot palletizing building on a mezzanine level. After passing through scan tunnels, the cases move in-line to one of two Honeywell Intelligrated-supplied IntelliSort sliding-shoe sorters, each of which feeds one of the palletizers. Shoes on each sorter automatically slide across the conveying surface to divert products to 28 accumulation lanes used to gather cases. Cases remain in the accumulation lane until the full number required to build a pallet load have been gathered. Once all the cases have been collected, they're conveyed single file from the mezzanine to the floor level of the building, where the palletizers reside. As cases enter the palletizer system, a series of wheels turn to adjust the cases' orientation as well as position them left or right so that they slide into specific positions to create a single pallet layer. The number of cases in a layer varies according to pallet and case size. For example, it takes nine of the standard 40-pound cartons (the industry standard) to form a layer on a 40- by 48-inch pallet. This view of one of the palletizers from above shows the layout of the area. Once a layer is built, the palletizer uses a pusher to gently slide it off onto a pallet. It then begins building the next layer. To assure a stable stack, the cases alternate their orientation from one layer to the next, much the way bricklayers set blocks into a brick wall. When the new layer is complete, the system lowers the pallet to allow space for the new layer to be pushed off onto the previous layer. The process continues until a full pallet is built. While that might sound like a time-consuming operation, it actually takes place in seconds. 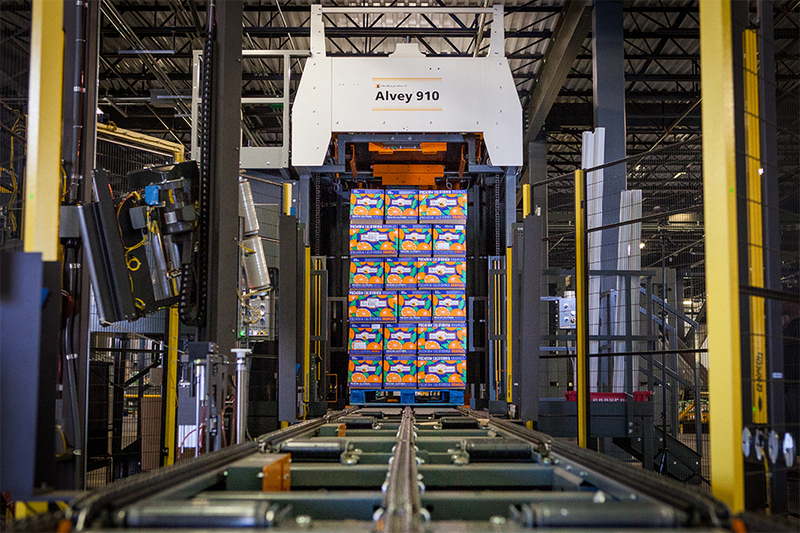 Each of the Alvey 910 systems is designed to palletize up to 125 cases per minute. Completed pallets then move via conveyor to workers who manually add corner boards to protect the loads during shipping as well as pallet identification tags for tracking purposes. The pallets are next sent to one of two automated stretch wrappers, with each of the palletizers feeding one stretch wrapper. The loads are wrapped for stability and then discharged onto holding lanes. Forklifts next gather the pallets and take them to temporary cold storage, where they are staged for a few hours before being loaded onto trucks. Some 125 loaded trucks leave the facility daily. 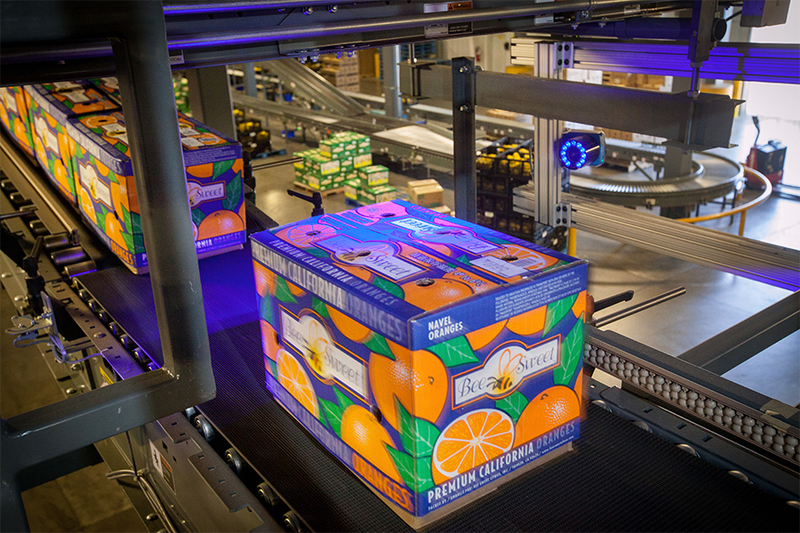 Bee Sweet Citrus has stacked up some solid benefits from moving to the new automated palletizing system. To begin with, work no longer backs up because palletizing is unable to keep pace with production. "It has made a tremendous change to our operations," says Marderosian. "Before, it was stop and go. Now, we have a consistent flow." He adds that simply eliminating the bottlenecks has allowed the company to move more volume through its packing areas and overall operate more efficiently. Marderosian also reports that the facility has seen a significant reduction in the labor required for its palletizing operations. And because there's less need for repetitive lifting of heavy cartons, associates experience fewer workplace injuries. On top of that, the constant pressure to keep up with the rest of the operation has eased, creating a more pleasant work environment. Employee turnover has dropped as a result. The benefits don't end there. The operation has seen advantages with respect to sanitation and accuracy as well. For instance, in an operation where food safety is always a concern, the automated palletizers have cut down on the number of human touches required in processing, while simultaneously ensuring that the right case is placed on the right pallet. This has enhanced the company's tracking and tracing capabilities. Lastly, customers see more solidly built loads coming from the facility, which helps prevent damage in transit. "The system builds a better, straighter load," says Marderosian. He adds that Bee Sweet Citrus is considering the addition of a third automated palletizer system as future volumes dictate. Feedback: What did you think of this article? We'd like to hear from you. DC VELOCITY is committed to accuracy and clarity in the delivery of important and useful logistics and supply chain news and information. If you find anything in DC VELOCITY you feel is inaccurate or warrants further explanation, please ?Subject=Feedback - : Bee Sweet Citrus juices up its packing operations">contact Chief Editor David Maloney. All comments are eligible for publication in the letters section of DC VELOCITY magazine. Please include you name and the name of the company or organization your work for.